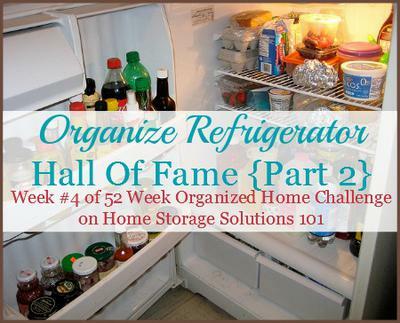 Here's the second part of the Organize Refrigerator Challenge Hall of Fame, where readers who have taken the challenge for the week can show off their accomplishments, and what they've done to improve the functioning of their home this week. You can see the first part of the hall of fame here. 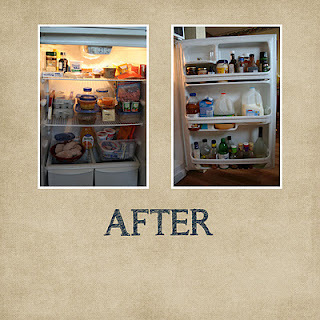 Below you'll find more before and after pictures (scroll down to see them all), along with organizing and storage tips and ideas, from readers to get you inspired to tackle your own fridge clean up and organization project. 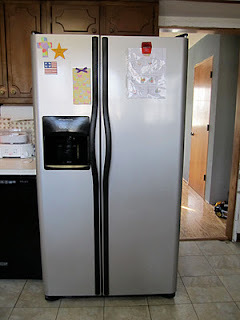 If what you see gets you excited to begin yourself, you can read the step by step instructions in week #4 organizing challenge, all about this large appliance. 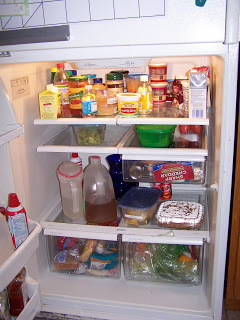 In addition, study the refrigerator storage chart here so when you're getting organized food safety also is considered. Make sure to take some before and after pictures, and then you can show off all your hard work in the Home Organization Hall of Fame as well. Send in your pictures, and I'll add the best ones to the website! 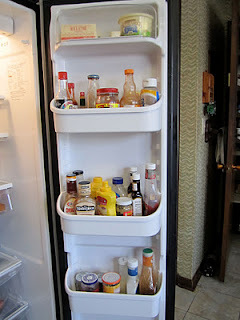 Jan from The Crafty Mermaid's Grotto decluttered and cleaned out her refrigerator for this challenge. She doesn't mention it within her blog post one way or another, but it appears from the after picture that she added a turntable, also known as a lazy susan, to the top shelf for holding condiments. Either way though, this is a great organizing trick. You can more easily reach the bottle or jar you need without knocking everything over using one of these simple devices. Here's another picture of this organizing trick in action, sent in by a reader, Thelma. She said, "Top shelf is a lazy susan item. So items are accessible." Note you should pay attention to which diameter you purchase, because it will impact where such a storage solution will fit, and also what and how many items will fit on it. They vary from about 9-16 inches, for example. Leigh from Joy and Strength shared a couple after pictures. I really liked how she added containers to the bottom shelves. She explained, "We go through an amazing amount of yogurt, cheese strings etc. and they are usually strewn ALL over the fridge! After putting boxes into my freezer I realized I could put bins into my fridge! Voila! There is room in the bins for about 1 week worth of each and the rest is kept in the downstairs fridge. I will also be labeling the door bins "jams/jellies", "sandwich stuff", "dressings" to help the rest of my family keep all the various bottles and jars in approximately the right place!" I love the containers! I know what you mean about yogurts somehow migrating all around the fridge somehow. This can be a great way to fix that problem. 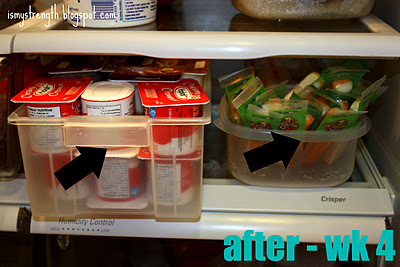 Similarly, another reader, Stephanie, sent in this photo of the containers she placed in her own fridge. She said, "It's so much easier to find things when using baskets or trays. I keep a bin on the bottom shelf for kids snacks, lunch meats and cheese. Then they aren't rummaging around as much." 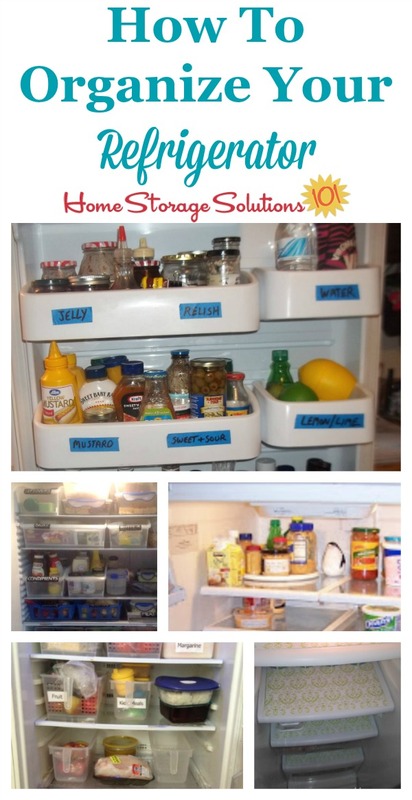 Adding labels to the shelves or door of your refrigerator will help you and anyone else who is placing items in the refrigerator to keep the organizational method you've decided upon. You can easily see where things are supposed to go, making it a no-brainer to place it back in the same place again. These photos above were provided by a reader, Dot, who said, "The labels are big and ugly (I can see them without my glasses though!) but will do until I get a label gun. Maybe now things will go back where they belong instead of just thrown in there to land where ever it may!" 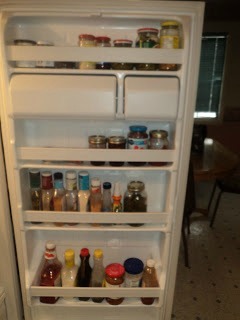 Another reader, Emma, also sent in a photo of her newly organized fridge. She labeled the containers themselves, which also works really well. She said, "Thanks for the inspiration on how to organise a fridge. You inspired me to do mine. It's simple but it works for us." Diane from Where Do I Get Started? shared some after pictures of her refrigerator and the door of this appliance. She says: "For me the fridge was easy because I had already purchased baskets to hold things so it was just to take everything out and wipe it down. 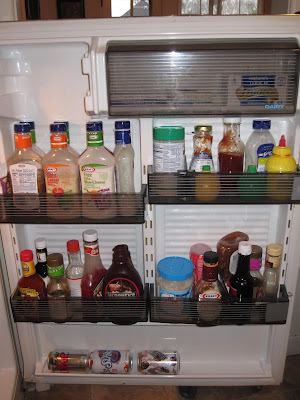 I re-organized the condiments on the door though. I still need to label my baskets which I will do later today." 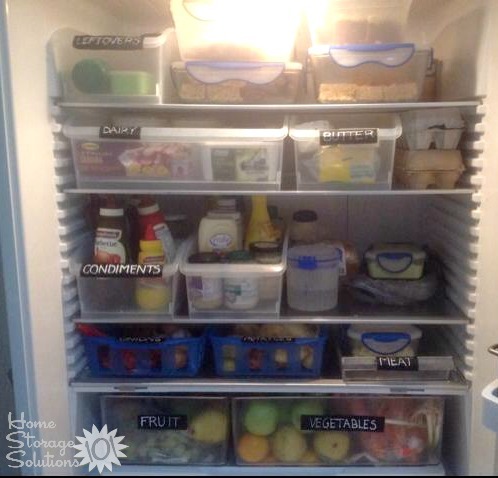 Here's another picture from a reader, Sharon, who also organizes her refrigerator using containers. 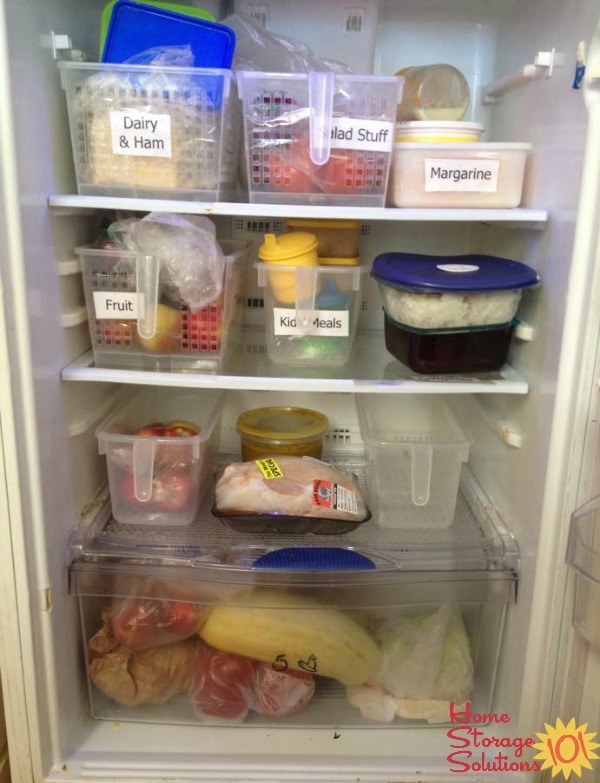 She labeled the containers to make it even easier for everyone to know what goes where. 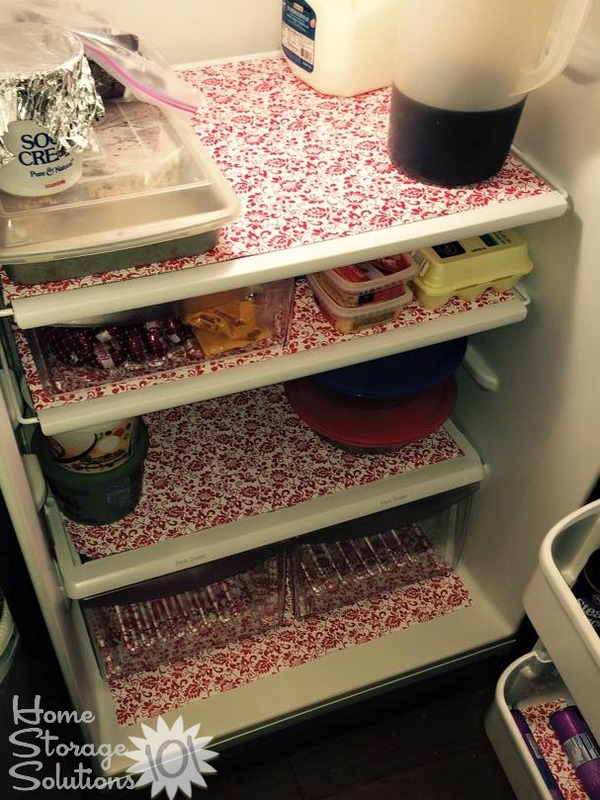 Sharon said, "My fridge has plastic draws from Kmart. They have little wheels on them so they are easy to pull out and in and they are labelled so my son knows where to find things and where to put them back!" Jessica from His Plan, Not Ours showed off the hard work she did for this challenge. 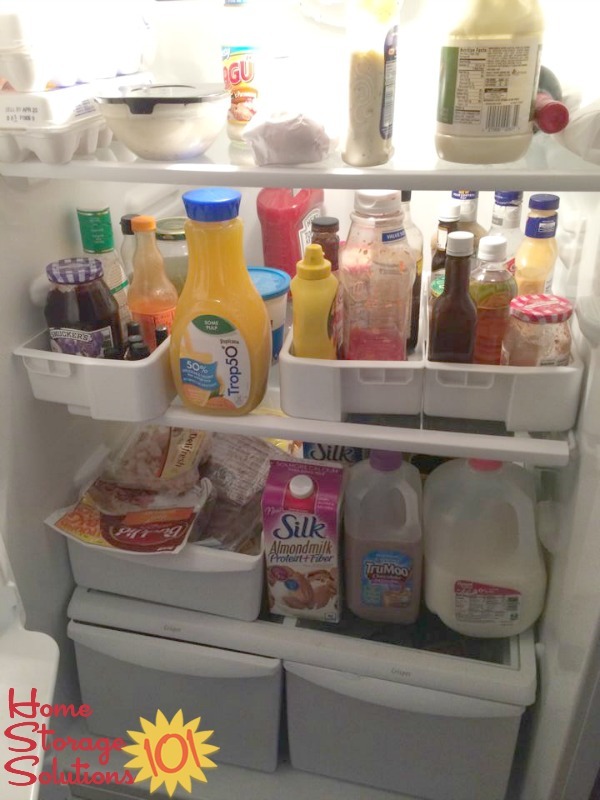 She said, "The zones have been so helpful for our fridge organization. I don't know why I never thought of it before. 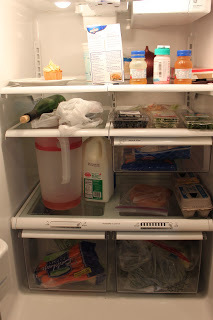 I mean, we did typically put Owen's stuff in the top of the fridge, but leftovers kind-of went wherever and our fresh fruits got pushed to the back where they were never eaten and meat I was thawing for dinner just got shoved in as well. Now, we can easily grab fruit for a snack and Tim knows exactly where to blindly grab at 5 a.m. for leftovers to take to work for lunch." 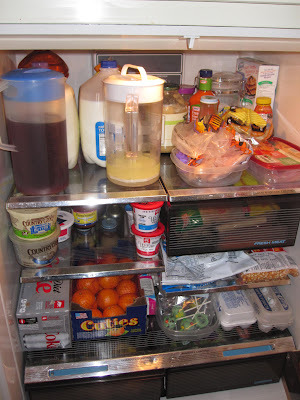 Along with organizing, you need to think about clean up in your refrigerator, because with food, it often happens that something leaks or drips. 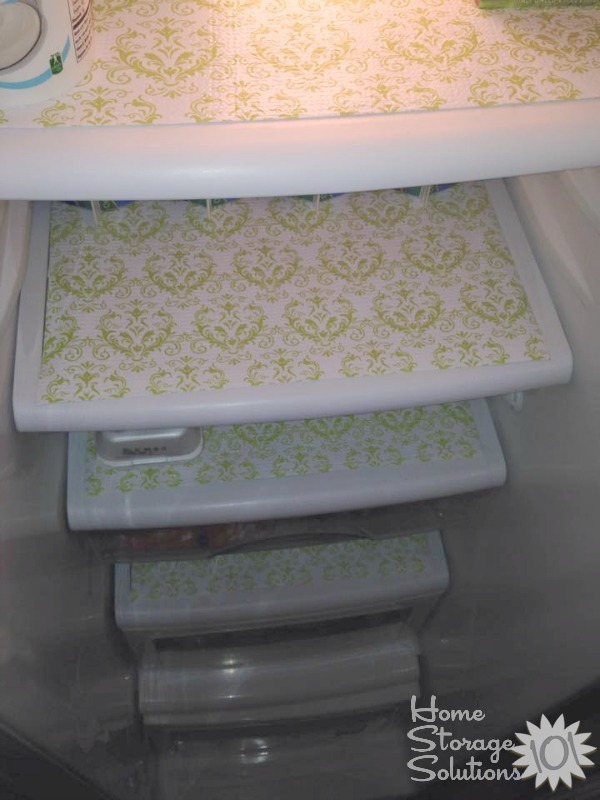 One reader, Michelle, sent in the photo above showing how she added shelf liner to her fridge. She said, "I lined the shelves of the fridge with a smooth top shelf liner. The bottom is clingy while the top is a solid, smooth surface. This should help contain spills. Now, should something leak, it won't ruin the rest of the fridge!" 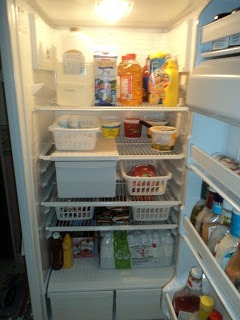 Here's another photo, this time from a reader, Wanda, who also used shelf liners in her fridge. Angela from Confessions of a Craft Addict blogged about her results from this Challenge. 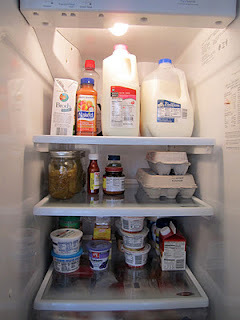 This first set of pictures shows several after pictures from where she organized her refrigerator, on both the outside and inside. 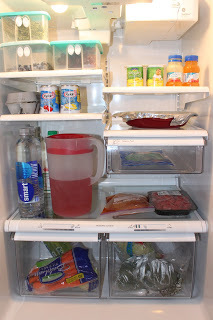 While this particular page of the site focuses on the inside of readers' fridges, clearing off the outside is also important. You can get more inspiration for decluttering the top and front here. Jennifer from Life of Reilly shared her before and after pictures in a collage. 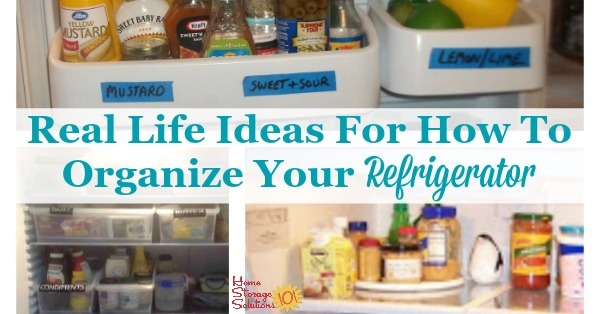 I really liked how she thought about the sections and uses of her refrigerator before she began organizing, so she could create all the "zones" or areas she needed to make them functional. 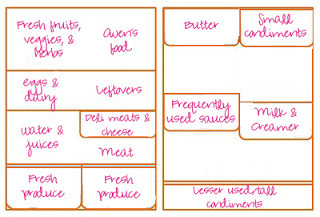 This makes it much easier to know what I have, and to plan meals around what I have in my inventory. That is exactly the type of benefit that this organizing challenge can give to you! Thanks so much for the inspiration and great before and after pictures Jennifer. Megan from Life of the Lorenzens shared the after pics from this challenge. 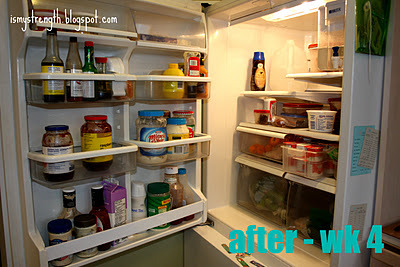 She said, "I actually cleaned out the fridge--including scrubbing down all the walls and shelves--right after Christmas when the fridge was emptier than it had been or would be for a long time. I purged a few expired items, but should probably do some more. I cringe when I read the food storage guidelines. I have some pretty old jars of pickles in the back, too. ;o)"
I think it looks great Megan! 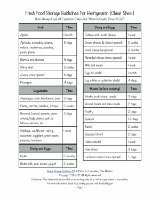 What Megan is referring to in regard to the guidelines is a refrigerated food storage cheat sheet I created that tells you how long certain things are good in your fridge after opening. You can click the image of the printable to go to the page on the site where you can get your own! I hope these before and after pictures have given you ideas for how you can get this large appliance in your home organized, and also inspired you to actually do it. If you've caught the organizing bug I would love it if you'd join the 52 Week Organized Home Challenge. As a participant you will, over the course of the year, work on each room of your home, and lots of different items, so that by the end you'll have a decluttered and functional home. In addition, if you do this or any of the other challenges make sure to take before and after pictures and I'll add the best ones to the hall of fame. You can submit your photos here. I've considered the basket idea for our office refrigerator - people just come in and bring plastic bags for their food. Can't tell what belongs to who, or how old it is. If we give each person a basket and they have to contain their food in their basket, we might have more space and less mess! I use containers in my fridge, mostly FridgeSmarts and Vent N Serves, but also my Tupperware bread box. 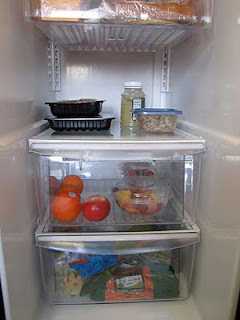 My FridgeSmarts hold my produce and keep it fresh longer and the VentNServe is for my prepped cooked foods. The bread box is for deli items like cheese and then I use the produce drawers for things like pudding and jello so snacks are easy to find! It works to organize this stuff! It works. So does applying this to your pantry. In a matter of seconds I know what I need from the grocery store at a glance. refrigerator with a bottom freezer? 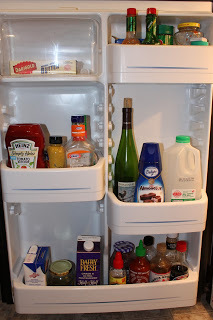 Is there a solution for a refrigerator with a bottom freezer drawer? Can someone help with chest freezer organization? I have a terrible time organizing it, falling to the bottom (me too), etc. 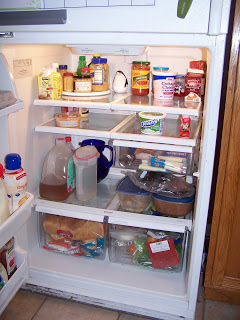 Hi Mary, here's my article on chest freezer organization. Hope it helps give you some ideas! If you have wire shelves, shelf liners will block the cold air circulation necessary to keep temperatures even. If you have glass shelves, provision is made for cold air circulation around the edges of the shelves, but I'm not sure why you would need shelf liners with glass shelves. I got glass shelves in my last refrigerator thinking it would be "nice" to help any spillage. Actually what happens is the spillage goes under the glass and the plastic frame that surrounds the glass. This actually makes it harder to clean. The other problem just over 1 yr after you have the refrigerator the plastic tends to crack on these shelves and the replacement cost is very high. I will no longer buy a glass shelf refrigerator, just give me adjustable metal shelves.